The best advertising Website of 2019 will be named as part of the 23rd annual international WebAward Competition for Web site development. The WebAwards is the standards-defining competition that sets benchmarks for 96 industries, including advertising, design and marketing web sites, based on the seven criteria of a successful Web site. The deadline for advertising web sites to enter to be judged is May 31, 2019. Boston, MA, March 18, 2019 --(PR.com)-- The Web Marketing Association is looking for the best advertising Websites in the world as part of their 23rd annual international WebAward Competition for Web site development at the WebAward Web site. 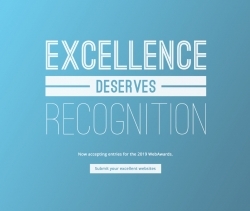 The WebAwards is the standards-defining competition that sets benchmarks for 96 industries, including advertising, design and marketing web sites, based on the seven criteria of a successful Web site. The deadline for advertising web sites to enter to be judged is May 31, 2019. “The advertising industry is very competitive when it comes to Web development and companies can benefit from the independent evaluation of their online efforts,” said William Rice, President of the Web Marketing Association. “Advertising websites need to balance their wish to show off creativity and capability via their webs design with the equally important need to inform prospects and clients.” Increasingly awards have been added to new business pitches to demonstrate third party validation of skills and to increase creative credibility to prospective clients. All advertising entrants benefit from receiving valuable feedback in terms of their specific scores compared against the average scores for their industry. They also may receive specific comments from the WebAward’s professional judging panel on their Web site development efforts. Each year the Web Marketing Association names the Best Advertising Website and Best Marketing Website based on the scores submitted by the competition judges. 2004 - Gigapixel Creative for Gigapixel Creative, Inc.
Advertising related Websites can be entered into consideration for the 2019 Best Advertising Website and other related WebAwards at the WebAward Website.